AlphaNinja - Good expense control helps UNFI beat estimates despite weak sales, in a "medium quality" earnings beat. 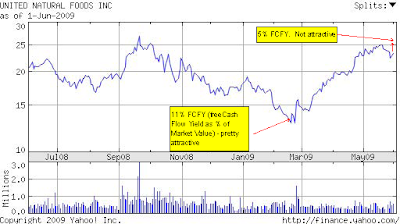 A quick look at how using cash flow yield, or FCFY as I call it, can help with stock selection. Without looking at the chart below, would this company be attractive at a 5% yield? (Note that a 5% yield is more expensive than the world's most reliable companies). Probably not. But at an 11% yield it's probably not a bad investment.